Under tensile stress, solids break, and liquids flow. How does flow evolve into fracture when the material undergoes a liquid to solid transition ? The question here is indeed the change in the mechanical response of a solid undergoing a rigidity transition, such as the sol-gel transition. Experiments are performed on two colloidal systems. Since these materials are extremely soft, we use microfluidic devices to apply a tensile stress, and observe the resulting cracks or viscous fronts propagating through the sample, in conventional or in confocal optical microscopy. The first system used is an aqueous suspension of silica nanoparticles, the sol–gel transition of which can be controlled by adding a certain amount of salt. 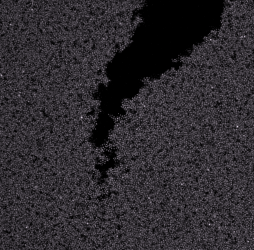 Because of the small size of the colloids used, the dissipative processes at stake are not resolved in optical microscopy, but their consequences on the shape of the cracks and on the displacement field are accessible. We show that, although the sol-gel transition is second order, the flow to fracture transition seems to has many features of a first order transition. The second system consists of microgels of diameter close to two micrometers, in a solvent which undergoes phase separation at a given temperature. As a result, close to this temperature, the colloids are attracted to one another and start forming an amorphous solid. Dissipative processes such as the formation of microcracks and local irreversible structural rearrangements can be observed directly, in confocal microscopy, and their contribution to energy dissipation can be evaluated.